Partypoker has announced it is to run its Powerfest online poker festival during the first three weeks of May, and is making it the largest ever guarantee, some $7,800,000 million. As with its previous edition of Powerfest, this latest incarnation sees each week split into buy-in levels ranging from $5.50 up to a hefty $5,200, plus weekly main events. 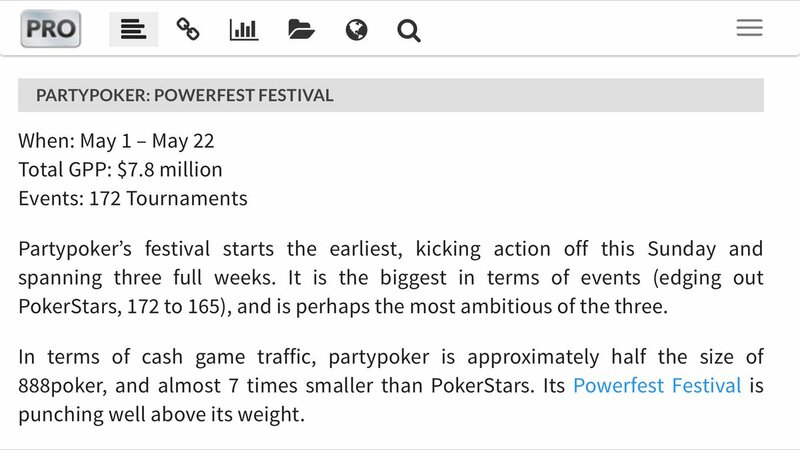 A total of 172 Powerfest events are planned across the three weeks, with the Featherweight category kicking things off on May 1, followed by the Middleweight events from May 8-15, and both the Heavyweight and High Roller categories running alongside each other from May 15-22. Looks kind of bland, with it being all nlhe!